This cereal began as an idea for a sugar-coated flake cereal in 1972 which was to be called Freakie Flakes. Ralston dropped the flake cereal in favor of a new puffed cereal which they called Freakies. The cereal pieces were Cheerios-esque loops with a flavor reminiscent of Quaker's Quisp cereal. The cereal was an instant success when it launched. This was due mainly to the bump-covered monsters called the Freakies who appeared on every box. 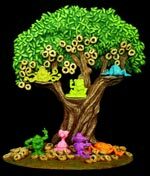 As the commercial story line goes, the Freakies searched for the mythical Freakies Tree which provided an endless supply of Freakies cereal. Once, they found the tree, they decided to live there forever. The first time the Freakies were seen on a cereal box, they had already found the tree. Subsequent commercials backtracked to tell the legend of the Freakies Tree. Fun Fact: All the Freakies characters were based on actual people who worked with the copywriter who created them, Jackie End of the ad firm Wells, Rich, Greene. A chocolate version of the Freakies called Cocoa Freakies was introduced in 1973. A fruit version called Fruity Freakies hit stores around 1975. All of the Freakies cereals disappeared from shelves around 1977. 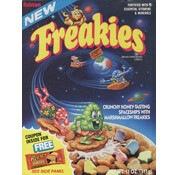 In 1987, Ralston tried to bring back Freakies cereal. The new incarnation was described as "crunchy honey-tasting spaceships with marshmallow Freakies". The Freakies character, who had become more glossy and 80's looking, were all shown riding cereal-piece surf boards in space. The new space Freakies didn't fly with consumers. The cereal was discontinued the following year. There's a website dedicated to Freakies called freakies.com. Another site (found here) has put together a collection nearly every Freakies box ever produced. These are the most recent images. Click here to see all pictures for Freakies. What do you think of Freakies? Greatest food humanity has ever invented!! My second favorite after Cap'n Crunch. It was amazing! Nothing beat the original, 1971-77. My dad bought a case of Freakies (24 boxes) for all 6 kids to share. I think I ended up eating 18 boxes. A really good cereal. Loved it. Wish they would bring it back! These were the best cereal characters ever - bring them back. My bother and I ate them as kids. We loved them. We also loved the refrigerator magnets, and collected them all. Back in 76. Hope they come back!!!!! Great characters & ads but the cereal tasted awful! 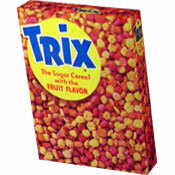 PLEASE bring Freakies Cereal BACK! I ate the original flavor as long as it was on store shelves! I EVEN have a Freakies T-shirt! Thanks for the commercials! The "theme song" instantly came back! Now my siblings and I are teaching our kids!